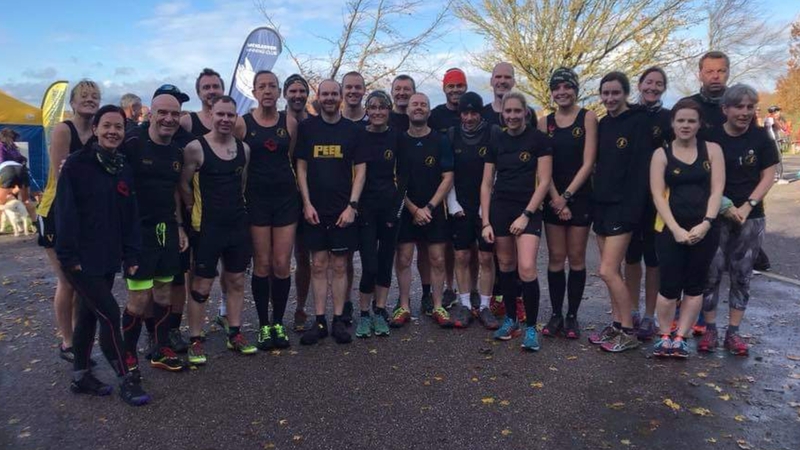 The club was well represented at several parkruns on Saturday morning. At the club’s home event at Kingsbury waterpark, new member Mark Webster was first home in 9th place overall in 19.27 mins. He was followed by Mark Boffey (23.26), Dave Fern (24.05) and Allan Williams (26.03) who narrowly edged out Simon Gordon (26.04). Not far behind were Martin Hollamby in 26.29 mins followed by Tim Mudd (27.01), Jo Insley (27.24), Lisa Fletcher (30.02) and new members Ann Hill (32.18) and Wendy Bowyer (34.16). Peelers playing away on Saturday morning were Mike Shelton (23.13) and Jackie Tierney (28.13) at the Sutton Park event, Michael Stevenson who completed the Hove event in 29.55 mins, Andrew Pickard who completed the Rotherham parkrun in 23.19 and Marcus Fairburn who clocked 26.35 at Solihull. Sunday was the second round of the Derby Runner cross country league, held at Foremarke Resevoir in Derbyshire. The race began after the 2 minute silence, which was moving and well observed, including the scattering of poppy petals.Conditions proved to be challenging with very soft ground after recent rain and a strong wind, which made it feel cold despite the weather being dry and mild. The 5 mile course was a tough one, featuring plenty of mud, uneven ground and some steep hills. 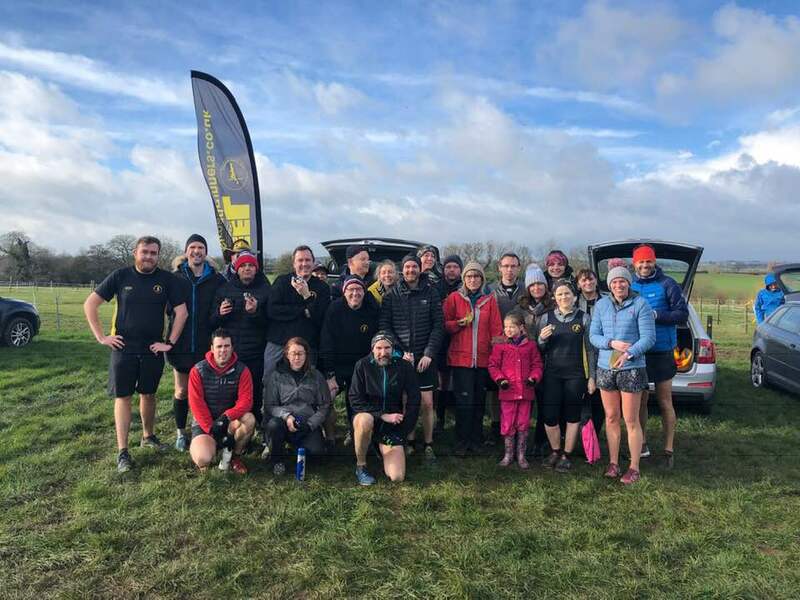 There was a strong club turnout with 23 participants and some strong individual performances with Emma Pick winning the ladies’ event and Ashley Baldwin second in the mens’ event. As well as those club members running, there was support from other club members with Ray Rodgers providing transport and support, Jo Insley helping with the finish tokens and Karen Grigg and Rachel and James Rickards providing valuable support on the course. 12 year old Byron Crane also acted as a marshall. Very welcome too was a large collection of chocolate and cakes at the finish line! Mens’ competition: Ashley Baldwin 2nd, Lee Rickards 23rd, Mark Webster 26th, Malcolm Bembridge 43rd, Andrew Pickard 46th, Craig Smith 63rd, Mike Shelton 64th, Craig Strong 75th, Trevor Thompson 78th, Mark Boffey 95th, Simon Gordon 101st, Stuart Hatton 106th and Ian Grigg 122nd. Ladies’ event: Emma Pick 1st, Hannah Jenkins 12th, Judith Matthews 19th, Rachel Casey 24th, Natalie Walker 26th, Sandra Ingram 33rd, Sophie Galloway 38th, Lisa Crane 48th and Val Lawson 55th. The most energetic Peeler of the week was Owen Slater who completed the Druids Challenge ultra race, a three day, 84 mile traverse of the Ridgeway, representing more than a marathon a day. However there was no rest for the wicked as the next day Owen was back in Tamworth leading the first session of the new ‘Bridge to 10k’ course.